This is our very most favorite birthday tradition. It’s inexpensive and so much fun for my kids. They look forward to it just about as much as the presents. My mom started this birthday tradition with me and my siblings growing up and it was something I loved so of course I passed it along to my kids. It’s just a tension rod with rope and clothespins. You use the clothes pins to hang their favorite treats, small presents and balloons from. We hang it from their door the night before so it’s ready for them as soon as they wake up and walk out of their door in the morning. My kids don’t get a ton of candy and treats so this gives them something very fun to look forward to. They are usually telling me months in advance what they want me to hang on their door for their birthday. I love making birthdays at our house extremely special; it’s super important to me to enjoy the chance to celebrate them as an individual. I never want them to feel lost in the shuffle with a large family and this is just one way I try and make them feel like they are MY favorite. This is so easy to make; all it is it is, is a tension rod like this. You can get them anywhere, Wal-mart, Target, or any place like that. You’ll also need some rope. I suggest rope not yarn; you don’t want something that tangles easy. Put your tension rod between your doorway and measure how long you want your string, cut it and then tie it in knots to the top of the tension rod. Get some clothespins like these; again these can be purchased at so many places including craft stores. 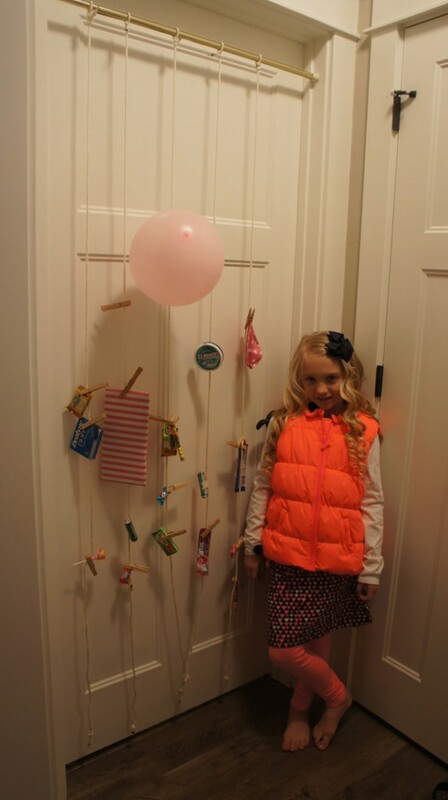 Use the clothespins to hang the candy, balloons, presents whatever you’d like. Do this for your child’s next birthday and I am pretty sure you will be the coolest mom/dad ever! If anyone tries this I would love to hear feedback on what your kids thought. A tension rod like this. Rope or para cord like this (you could use any sort of rope that’s heavy duty from anywhere, maybe you can even find some in the garage:). Clothespins like these. (these can be purchased a number of places as well). Put it all together like you see in the picture or with my written instructions and you’ll have the coolest/easiest birthday tradition ever and your kids will love every bit of it. *When we are finished with a birthday I leave the rope attached and the clothes pins on the rope and wrap the rope that has the clothes pins on it around the tension rod and store it with my wrapping paper. Then I just pull it out for the next birthday – just a tip for storing it (I hate clutter and like simplicity so that’s easiest for me).